New monoplane fighter first flown in June 1933. Under development since the appearance of the I-100 at Cordoba. SuperAero asked interested companies to develop a new fighter monoplane with performance exceeding that of the I-100. The date set for the competition was 1934 so the projects had plenty of time to gestate. In fact, the companies needed the time to adjust to monoplane manufacture and do more research on aerodynamics. The CR.35 is an extremely lightweight fighter aircraft constructed from regenerated wood instead of the increasingly common duralumin and other alloys. A strong, easily repairable and cheap material. The performance tests over late 1933 and early 1934 were extremely succesful with 12 pre-production aircraft being ordered. The aircraft is a considerable leap over the preceding biplanes. Vastly increased speed and climb rates yet actually handling better. It is quite likely that the production aircraft will use a revised supercharger arrangement to give more power at low level. An aircraft continuing the tradition of innovation from Magni. The novel arrangment was tested in the wind tunnel at Guidonia and found to be satisfactory. 3 prototypes were ordered and delivered in 1934. The J.10 version had a radial A.80 engine and an Asso XI engine. Performance on trials was dissapointing. The aircraft was underpowered. The J.10bis version was constructed in July 34 and used two 1400hp W1518 engines. The test reports were much better and this version was ordered into production. SuperAero ordered 500 as light/medium bombers in 1934. Armament consists of a small internal bomb bay capable of holding 2x500kg bombs. SuperAero requested that the design be equipped for torpedo carriage. 4x7.7mm machine guns are carried in the wings. First flights from other aircraft. 1/3 scale model. Edit. I found a better picture. Caproni 211 Medium bomber. Specs when I decide on what engines to use. Three Macchi C.76 high speed research aircraft ordered in 1933. Similar to the C.72 but with rectractable undercarraige instead of floats. To offset the reduction in radiator area on the wings and floats, a ventral radiator is included. 'regenerated wood' didn't strike a bell. A quick web search found it was an Italian company's version of particle board. As I recall, plywood came first, then particle board, then OSB, etc. Double checking on Wiki, particleboard was a WWII replacement for plywood. Even if it was, the resins would not have been to the developmental point to provide the needed strength, so it should be plywood- which was around. Other than that, can we see the planebuilders posted? I'm curious as to what structural factor you're crediting to the plywood, among other things. Ah. I had no idea. I found it was used for some Italian aircraft 1940/41ish so assumed it had been around some time. In that case it'll be "wood"
For structural factor I used 1.00 which is probably too low if 1.00 denotes an Aluminium alloy like Duralumin. Looking at figures for strength/density Spruce is slightly better than Al-alloy. In buckling its over twice as efficient. Generic "wood" won't be quite as good but its in the right ballpark. Fiat CR.35	Note version with different engine. Looking at figures for strength/density Spruce is slightly better than Al-alloy. In buckling its over twice as efficient. Generic "wood" won't be quite as good but its in the right ballpark. Is the drawing of the 1942 SAI.207? I had been thinking it was a Finnish plane, whoops. The real one really did have sparkling performance. It's things like these that I like to try to figure out how the plane is built- much like neat ship designs. Anyhow, several things bother me about the plane. 1. Figured out why the weights gave me so much trouble, I think you were working off a prior version, as 1026kg <> 2461lbs, which could be due to the different engine. a) At 2 ft. it is very small, the pilot would only have a couple inches on either side of his elbows and the cockpit walls would curve in above there. You described the fuselage of the FW-187 as overly narrow, and as best I can scale it is about 2.88 ft.. The illustration would appear to scale at 2.5 ft. x 3.5 ft., or 3 ft.. Compared to the dimensions I have found for other inlines, that is small. 3.25 ft. appears to be the minimum for a similar sized Hispano. b) The 1938 Reggianie Re2001 had a 750hp Isotta-Fraschini Delta air-cooled inline engine, which appears to be what you are using, but appears to scale at a fuselage of 34 in.x51 in. = 3.55 ft.
c) The fuselage fullness is at .2, which is below the standard range, combined with the sub-sized fuselage, you really lack room, and the SAI.207 did not have extreme taper. a) At 996hp and 800lbs, it is out of range for a production engine. b.1) the Jumo211 is 41.5 in. high and 31.6 in. wide, or about 3.04 ft.. The other engines I have managed to find dimensions for are equal or larger. I presume one would want a little extra room for cowling/access. c) According to Wiki, the Merlin 61 only ran 0.95hp/lb. d) I would think the engine should be running around 1236lbs to fit the sim. 4. Wingform. At 0.8 that means it is basically very close to a delta. The SAI.207 appears to be more .5 +/- .1 . 5. Unstreamlined section. On the one hand I go on what I recall you posted, or -1/3 of the radial. That would be 1.7 ft. not 1 ft. However if you meant 1/3 then its .9. 6.User weight. You list 250. 4x.303MGs with ammo is 260. Add in a 2 ft.dia. 11mm disk at 54lbs and 314 is minimum. 7. Somewhere I missed something, because when I put in the airframe, the user weight, the crew and the 800 lbs engine, I got 55 spare lbs, which wasn't enough fuel. Some other things are not working out right. 1. Again putting in the same numbers not getting quite the same result. For example the payload was reading more- 4,189 not the 2,247. At first I was thinking different versions, but I pulled up your MC 72 sheet to work off of, so that doesnt make sense. 2. Engine weight is good here. 2 engines at 1400hp and 1,870lbs. 0.74hp/lb. But what production planes in 1939 were pusher-tractor like this though? Obviously some of the Italian seaplanes had that double ended nacelle, but this is a different thing. I know of the 1939 Fokker D.23, and the suspiciously similar 1942 SAAB 21j, but you know a heck of a lot more aircraft. 3. 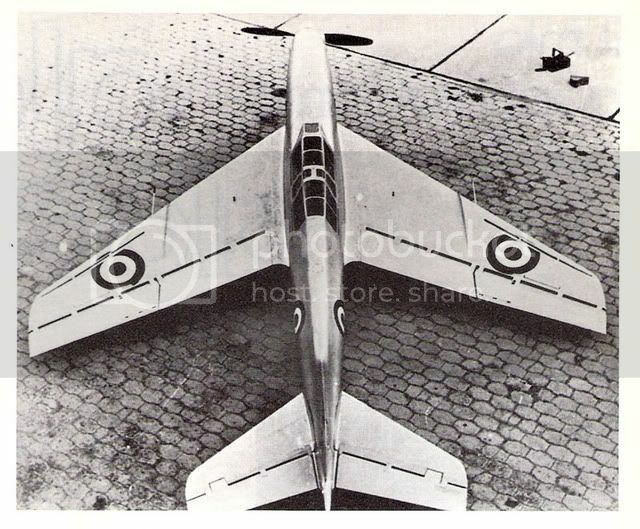 A heavily swept delta wing? 0.8 taper, 30% sweep? Youve posted about high speed research, but this seems a little much early and seems to have little effect. Again, you have a much wider knowledge of aircraft than I so maybe these were out, but until compressibility was more common it was unnecessary, plus I thought deltas had increased landing speeds which would be undesirable for rough fields. 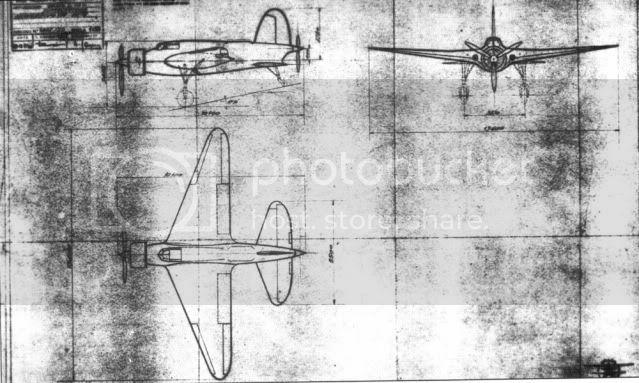 In order; The drawing is a modified Ambrosini S.7, same family as the S.207 but not the same plane. This aircraft has similar dimensions and slightly higher weight than the original aircraft. The original was a two seater os that saves some 250lb. 1. The full version posted has a different engine and supercharger with lower critical alt. 3. The engine I'm using is an Inline-6 of 140mm bore x 150mm stroke which gives a displacement of around 14L. With a side mounted supercharger it should be around 0.40 - 0.50m across. If you want a big explanation of this I'll send it to you as I pmed one to Hood tother day. I don't think that the weight is far off. 4. I never really understood that wingform bit. You can input leading edge angle and then the taper which gives you a figure for the trailing edge angle. I just did that until it gave me the rough figure I wanted. Or I just blame it on artistic licence. 6. Ammunition counts as payload. 7. I don't know. I'll send you the sheet. Fiat CR.35 with 45° swept wings It gives you a better idea of the narrowness of the fuselage. So, about half the displacement of the Merlin II, and almost the same amount of power. The weight looks about right for the displacement, it's the amount of power that's badly off. Even the late war Merlin 61 was only barely making a hp/lb ratio of over 1.0, yet here you're having a ratio of almost 1.25 in 1934. "Isotta-Fraschini are the other larger manufacturer. I was going to go with the Asso XI V12 and then simply give it similiar improvements to the Merlin. Its about the same size and weight for this. However, I needed an engine for the lightweight CR.35 fighter. After talking it over on another board I've gone for an Inline-6. 140mm x 150mm = 14L displacement. For the standard c. 40hp/L it'll produce around 560hp. Too little. To get more power I've discarded the poppet valves. Italy doesn't have access to sleeve valve technology so I've gone to positive action valves with two cams, one to open and one to shut the valve. Normal springs don't work at higher revs as they start to float. Desmodromic valves don't have this problem and because they are more accurate its possible to keep the valve open about 1/3 longer. All this means more revs, more power. Of course there are disadvantages to desmodromic valves - more expensive and harder to produce because they need more mechanical perfection. They're not suitable for mass production. This suits Italy perfectly. Her aviation (and car) industry is geared to producing high quality products in small quantities. Perfect for her. Another method of comparing power between engines is pumping capacity per minute. The Merlin manages 27x3000 = 81000L/min. This gives the Merlin I 1030hp/3000rpm/16000ft. Now I can use this figure to give a comparison with my own fictional engine. 14L displacement. With new valves around 4000rpm (probably 5000rpm+ is possible but I'm being conservative). Now 14 x 4000 = 56000L/min. Power = 1030 x (56/81) = 720hp/4000rpm/16000ft. I want a smaller supercharger to emphasize performance at low level. 16000ft is too high for the intended role. The Merlin II gave 1440/3000/5500. With a similar small supercharger my engine will give 1000hp. This has gotten quite long so I think I'll save the actual aircraft until later. The engine at the end of it is the L1406 (config,bore,no. cylinders). The engine block is about 250mm wide. The side mounted supercharger (to reduce length) will increase this to about 400-500mm. All in all and extremely low-drag engine." The Merlin isn't the best engine to use as a comparator for Hp/weight. 1.2hp/lb isn't too far off. Name another aircraft engine in available in production quantities (ie, 1000 units or more) in the 1930s that had a hp/lb ratio of over 1. There weren't any. This was a "holy grail" for aircraft engine manufacturers of the day, lots of different manufacturers tried to do it and none of them succeeded until the mid-war period. The Napier Sabre, for instance, the Sabre V had a hp/lb ratio of 1.29, and the Jumo 222 had a hp/lb ratio of 1.03 (but wasn't ready for production during the war years). The Merlin managed to exceed 1.0 during the war years (and after, of course), as did the R-2800, the R-3350, and the DB-605 (and others, not intended to be a complete list). Could something with these characteristics be built? Sure. But it would be something that would be unreliable, that would need SERIOUS maintenance after every flight, etc. Essentially a racing engine, which is fine for a racing aircraft, but not good (at all) for a combat aircraft. Oh, and a 4,000 RPM engine in an aircraft is going to need a pretty good transmission to slow that speed down to something the propellor can use. So, more weight, less power. It came out of discussions on another board for an "ultimate" engine. The one preferred was a 12L inline-6 turbosupercharged running at 7500rpm giving 1900hp from 100-oct standard fuel and weighing around 350kg. This is being extremely conservative by the standards. More weight maybe, but power levels are fine. Reliability is an issue but this version won't be around for a few years yet. Instead a 720hp version with RC.40 supercharger. Development from 1932 will increase power levels and reliability up to around 1500hp with 150-oct fuel. The engine will need to be strengthened to cope with the increased compression ratio which'll increase weight further. As long as the hp/lb ratio stays within reasonable norms for the period, I'm fine with it. A hp/lb ratio of 1.2 for a service engine isn't reasonable for the mid-30s. Certainly nothing available during the period suggests a 770 pound engine capable of 1900hp, if it were possible it seems unlikely that it wouldn't have been built. Again, show me one that was PRODUCED in this period like that. Not a fantasy engine, one that actually existed. There weren't any. So what if none actually existed in OTL. This isn't then. There are plenty of ahistorical things going on. Its not impossible to build what I am proposing. The weight is pretty accurate -> more for a 14L engine. The power is explaned above. So, your contention is that all the engineers working on engines of the day were idiots? The discussion hasn&acute;t reached its peak yet so I&acute;m not interferring but I thought it to be a good idea to let you know I&acute;m aware of what is the matter here.